Should you take the job? Quit the job? Begin a relationship? End a relationship? Move? Plant roots? How do we find God's will for lifes big decisions? What if you had total freedom? 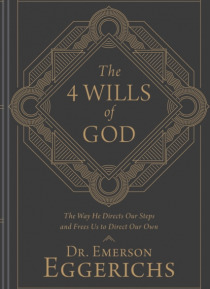 Emerson Eggerichs believes there is a clear answer to finding God's will. The Bible itself reveals the clue--a secret hidden in plain sight. Before launching his Love & Respect marriage ministry with wife Sarah, Emerso… n was a senior pastor for nearly 20 years in East Lansing Michigan. Before that, Emerson and a friend ran a free counseling center called ';The Open Door' in Cedar Rapids, Iowa. As Emerson navigated his career he found both he and the people he was counseling were wrestling with big decisions and knowing if that decision was really what God wanted. Immersing himself in God's word for over 30 hours a week for 19 years, he discovered simple, clear truths that set him and many others free. There is a starting point to discovering God's Will for your next decision and for your entire life. Begin here to read stories of people in the same situations you face today. You'll be able to discover the freedom you've been searching for, and then, like Emerson, you'll help others find that freedom too.